NursingHabits - The art of caring while cursing! Stress, pain and drug abuse in nurses. If there is one thing I’ve come to appreciate through nursing, it’s the complexity a single human being is made up of. The brain is one of the most complex things in the universe and it’s right behind the nose! Anatomy aside, the human spirit is quite a captivating thing. The one thing I’ve noticed repeatedly is that a person’s attitude and outlook toward life matters hugely and can effect the progression or regression of illness. When I was still a pupil nurse, it was new to me to see so many ill people so when I saw a 36 year old female patient wheeling herself into the surgical ward, I was stunned silent for a minute before I could ask what she had come in for. She was battling cancer, had a gangrenous right leg, and was booked to have her leg amputated that morning. While I struggled to come to terms with the state of her body, she kept a smile on her face and said “Don’t worry dear, it’s just a body. I’m made up of much more than this flimsy thing.” I felt embarrassed that she caught me staring but amazed at how bright and happy she looked despite the painful ordeal she was going through. The operation a success, her smile never faded. She kept a great sense of humour, helped herself as much as humanly possible, rarely rang the bell and never spent a single moment in self-pity. If she caught me pitying her, she’d stop me in my tracks. She believed there was still much to be grateful for. I know that there must have been hard times during the diagnosing and treatment process and that she wasn’t overjoyed having to deal with cancer but even though the cancer was destroying her body, she laughed a pure laugh and she strengthened people around her with her spirit and you couldn’t see a sign of sadness in her eyes. What matters is that she could still feel happiness and kept doing whatever she needed to do to live life the best she could, given the cards she was dealt. On the other hand in another ward, I had a diabetic patient who had gone blind. She couldn’t walk very far because her legs would ache under her weight. She’d cry all day and night, and she’d ask over and over again why God had punished her like this. Her body was full of aches and pains and while we’d do as much as we could to help her with pain relief, she would never be even mildly content. I’d try to comfort her and sympathized with her but she left me feeling a sense of hopelessness around her because she would remain unresponsive to any positive encouragement. Naturally her misery repelled people. Her family would rarely visit her which added to her misery. She wouldn’t smile for a single moment and she would not attempt to help herself or regain some independence. She looked terrible and she was miserable every day. Her ailments were far from a death sentence. With a diet change and a closely observed treatment plan, she could have returned to a relatively normal life but she saw the disease as punishment and so it became punishment and her blood sugar wouldn’t settle. She’d be continuously in and out of hospital, her family abandoned her and we had to hand over her case to social services. She no doubt, will continue to suffer and her condition will get worse if she keeps up that attitude. Whatever you’re going through, don’t let it consume you. There is something inside of you that’s indestructible and if you keep in touch with it, you will make it through any battle just fine. Edit: Coincidentally just as I finished writing this post, the song “Inside Us All” by rock band “Creed” came through my headphones! There really is a peace inside us all. I recently discovered some shocking news that a RN I used to work with died of Cancer. She complained about back and body pain for ages but dismissed it as part of the package when you’re a nurse. 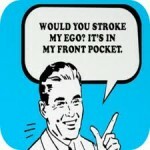 Every nurse experiences backache…nothing to panic about right? She was oblivious to that fact that she had cancer until 2 months prior to her death. She continued serving others until the day she died. Afterthought: I find it really aggravating to know that in South Africa, the hospitals don’t provide regular mandatory checkups for health care workers. We’re surrounded by doctors and medical equipment everyday. It wouldn’t take much to have free health checks for staff at least 6 monthly, if not every month. Does your hospital provide you with regular check ups? Are there gyms freely available? Do they provide counselling if you’ve been through emotionally taxing experiences? Nurses are human beings not machines…with the kind of work we do, our employers owe us a lot more than a pay check. One RN to heal them all! “The Yoga Nurse” – Be Inspired! “A half minute before that you were stepping into high school, and an unhooked brassiere was as close as you ever hoped to get to Paradise. Only a fifth of a second before that you were a small kid with a ten-week summer vacation, that lasted a hundred thousand years and still ended too soon. Zip! They go rocketing by so fast. How the hell else are you ever going to slow down?” – Dunbar. Anyway, the bottom line is, you have two choices. You can have an incredibly miserable but long life or a blazingly fast and fulfilling one. I chose the latter. With the internet being what it is today, none of you have any excuse to be trapped in a job you’re no longer feeling and a burnt-out nurse is probably every patients worst nightmare. You owe it to yourself and the nursing profession to be happy. If you’ve tried it all and still find it difficult to get through to 6:45 then, try something different! 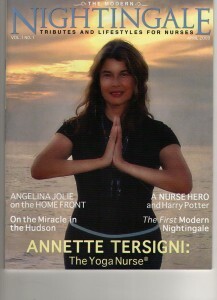 I’ve had the honor and privilege to work with a wonderful RN in the US, Annette Tersigni, better known as the YogaNurse. She is a nurse entrepreneur or yogapreneur and she has created a transformational new movement in health care called Yoga Nursing®. She helps nurses, yoga therapists and other care givers to learn her accredited programs so that they can relieve chronic stress, anxiety, pain and suffering for themselves, their clients and their communities worldwide. She runs her own blog, hosts retreats, learnt all the tricks and trends of the internet by herself and never lets age be a factor in determining what she can or cannot learn. Check out her website www.yoganurseacademy.com and you can be on your way to a fulfilling yoganursing career or just find a way to relieve your nursing burnout.